Now, I realise tomato season’s pretty much drawing to a close for most of us in the Southern Hemisphere, but I’ve been hearing reports of some late-season harvests in gardens around here; helped, no doubt, by the Indian summer days we’ve been having this autumn. And I’ve spotted some nice-looking heirloom varieties at the organic store – surely a sign that it’s still seasonally appropriate to be posting this recipe this late? And if there’s one last thing you make with fresh tomatoes before winter sets in, let it be this: Yotam Ottolenghi’s aptly named Tomato Party from his most excellent cookbook Plenty. Apt, because, really, a party is what this is: as many different kinds of tomato you can get your hands on, cooked to varying degrees, every mouthful is full of different incarnations of the tomato. Juicy roast tomatoes? Check. Savoury-sweet balsamic-glazed tomatoes? Check. 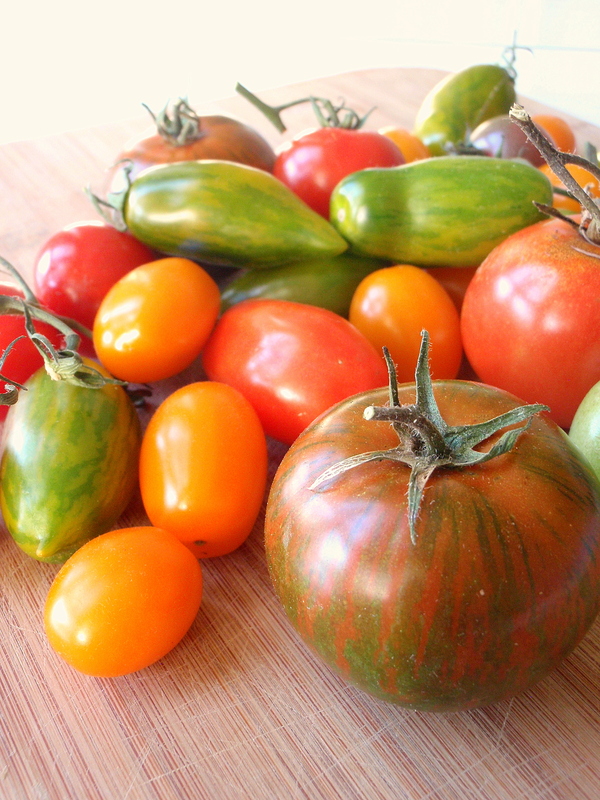 Raw, tangy and sweet tomatoes? Yep. 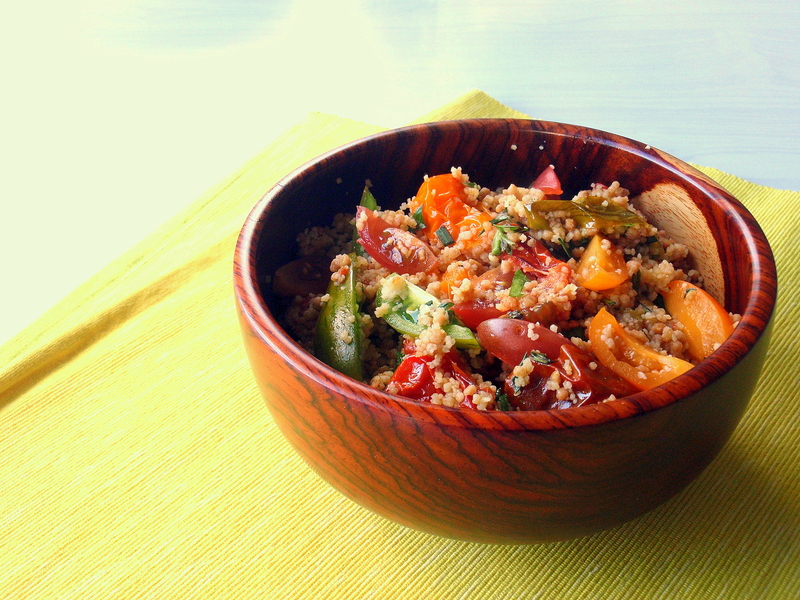 And you could keep going, too, adding different varieties of tomato or changing up the cooking method. It’s a fitting farewell for this summer fruit that frankly, I wouldn’t bother buying all winter. I was lucky enough to be given a paper bag full of beautiful tomatoes* from the very generous Sue of Five Course Garden, who has what is possibly the most productive compact garden of anyone I know. It’s tiny and huge all at once, and is truly a joy to poke your nose around (and I’m not just saying this because both times I’ve been to see Sue I’ve left laden with fresh produce!) – it seems like every nook and cranny has got something edible growing in it. 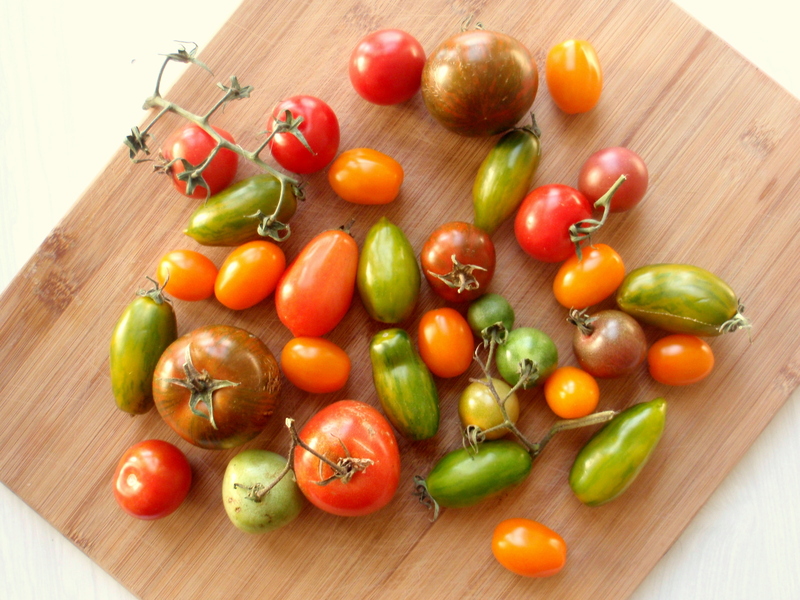 And these tomatoes – just look at them! They’re the exact opposite of the bland supermarket tomatoes that get especially blander and more average as autumn fades into winter. They were stripey and purple and green and juicy and sweet, with so much more flavour than anything you could buy. 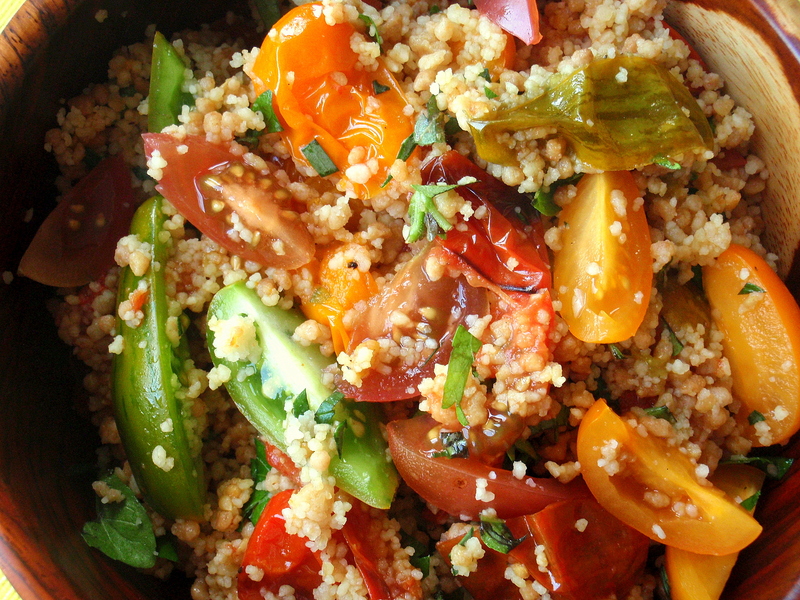 And what better way to celebrate them than this tomato-rich couscous salad? The recipe that follows, though, is going to be more of an imprecise method than Ottolenghi’s instructions, because yesterday something really happened: Kate and Jason came over and we swapped cookbooks, SO, now I have (temporarily) parted ways with Plenty and my other current favourite, Nigel Slater’s The Kitchen Diaries, and have got my hands on Ottolenghi: The Cookbook and Thomas Keller’s Bouchon, both of which have been on my cookbook wishlist for what feels like forever. Hooray! So anyway, I don’t have the book to refer to for this recipe, so I’ve cobbled together bits and pieces from memory and also from the ever-helpful internet (especially this earlier version of the recipe, which appeared in the Guardian in 2007 – actually, that might be pretty much the same as the version in Plenty. But I can’t know for sure). 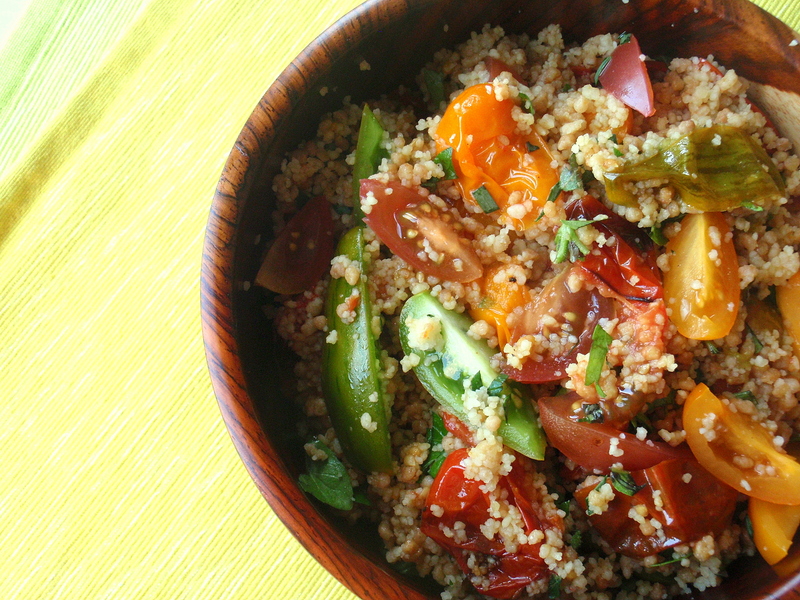 It’s more of a rough method, anyway – cook some tomatoes a few different ways, mix with a couple different kinds of couscous, enjoy. *Actually, the purpose of my visit was to pick up some tomatillos Sue had set aside for me – after sampling her harvest last year and making the best salsa verde and chilaquiles I’d had in a long time there was no way I was going to be able to refuse her offer. This year’s crop was great too – more on that later, though! Cook 125g couscous according to the instructions on the packet; fluff with a fork and set aside. Do the same with 150g Palestinian couscous, or mograbieh if you’re lucky enough to have some, or some fregola or Israeli couscous. Meanwhile, halve or quarter (depending on size – you want them to be bite-sized when they’re cooked) a good bunch of vine tomatoes, around 300g or so. Put on a baking tray lined with baking paper or tinfoil, season with a bit of salt and pepper, some brown sugar and balsamic vinegar, give it a good drizzle of olive oil. Put in the oven for about 30 minutes until they’re shrivelled but still juicy. The balsamic vinegar, sugar and oil should have melded with the tomato juice and be a little bubbly but not too sticky. 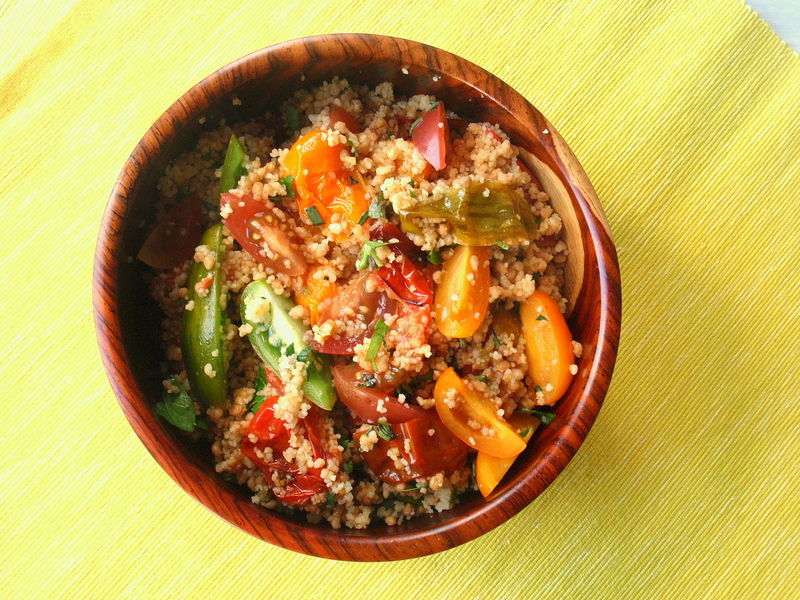 Remove from the oven and set aside in a bowl, adding all the juices from the pan. Next, increase the oven temperature to 200C/400F. Halve about 200g cherry tomatoes and place on a clean piece of baking paper or foil on your baking sheet, season them with salt and pepper and olive oil and stick them in the oven for about 12 minutes. Cut up some more tomatoes – about 100 to 150g – hopefully you’ve got an assortment of colours and sizes but if not, don’t worry too much. *Other things you could add at this point that would be very delicious: crumbled feta, torn buffalo mozzarella, shelled & chopped pistachios, bits of streaky bacon. Or nothing else at all. This is, after all, all about the tomatoes. **I can report this also tastes very, very good served at room temperature the next day, when the flavours have had a chance to mingle overnight. It’s hard to believe we’re already almost at the end of April, the days are getting shorter and darker, I’ve finally re-embraced wearing tights. It seems like just yesterday that we were all complaining about the lack of a summer, and now here we are, thigh-deep in autumn, whether we like it or not. I like it. Despite the deliriously frantic pace of the last few weeks, this autumn has been nice – that sort of settling-in feeling has set in, I’ve been making soups and curries and braised meats and bringing out the woolly jumpers and savouring every bit of it. This time last year was much the same: April sped by at a breakneck pace, just shy of overwhelming. But this time, though it’s crept up on me, I’m in a bit more control. If last April started with a bang and a headlong descent into a chaotic busy-girl frenzy, this year’s April started with a whimper and a steady crescendo to a controlled pandemonium. Which is better, I guess. At the beginning of the month (and I can’t believe it’s already three weeks ago) I found myself huddled under the duvet in a friend’s* bed in Auckland, that horrible alternating between shivery cold and feverish sweat, dreaming weird feverish dreams in which I didn’t make it back to Wellington alive. Of all the times I could possibly get sick, of course it had to be on a weekend away. So that was awful. But despite my fever-induced delusions to the contrary, I did live to see the morning (and an excellent breakfast at Kokako in Grey Lynn, and the Degas to Dali exhibition at the art gallery, and some amazing turbot sliders at Depot), and I managed to make it back to Wellington alive. And when I got home, I made this soup. 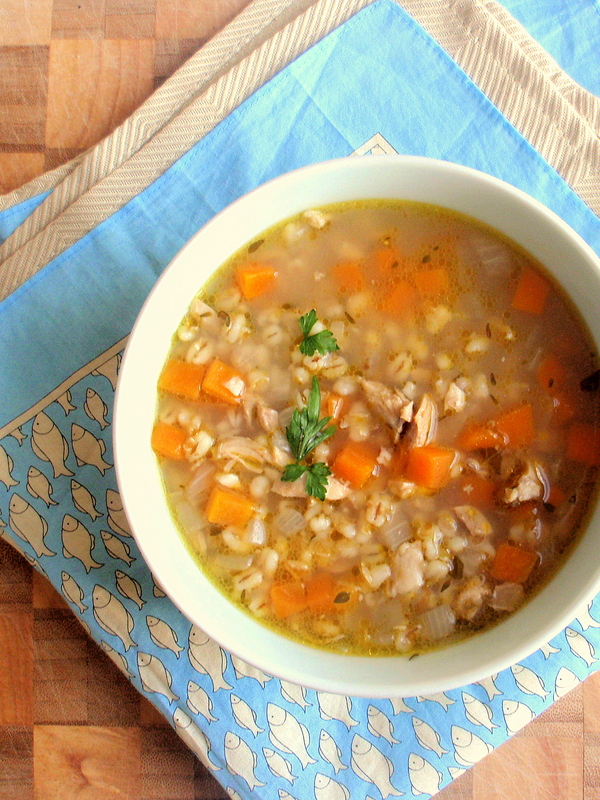 It’s a simple chicken soup, simple enough to make when you’ve got nothing in the fridge, just as long as you get some bone-in chicken pieces and a carrot or two. It was super delicious, and it saw out the rest of my cold, and the rest of that crazy-busy week when the only thing I wanted was the thing I didn’t have time for: rest. You see, chicken soup is the best thing for when you’re sick, tired, hungry, stressed, overwhelmed, all those things that happen to people all the time but to me especially when the seasons are changing and it’s getting colder and darker and things are getting busy. It’s down-to-earth, pure, simple comfort food, and it’s kept my feet firmly planted on the ground during what was an incredibly busy couple of weeks. This recipe is really more of a loose method than anything else. 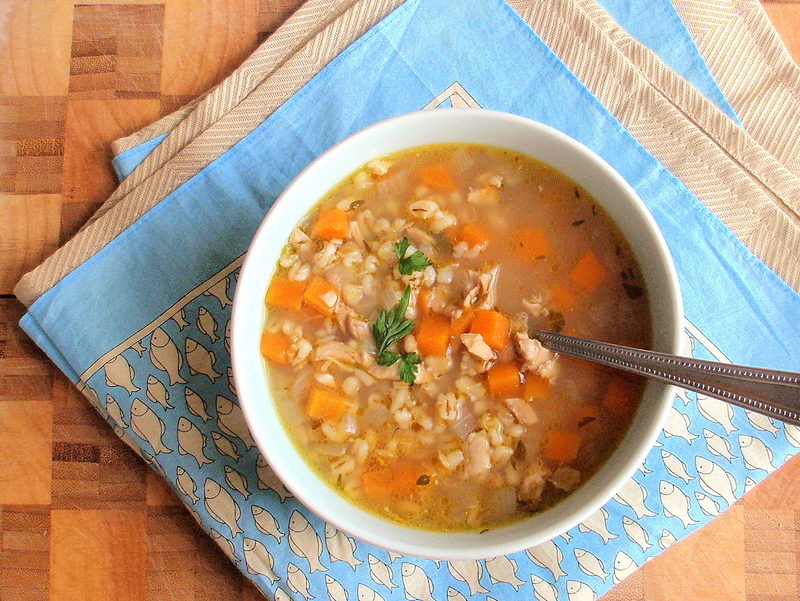 You might have your own favourite chicken soup recipe; for those who don’t I’m sharing mine. It’s simple enough that you can make it even when you’re too feeble to do much else, which is an important thing for this kind of food. Feel free to get creative and add or subtract ingredients – the key thing you’re looking for is a deeply soothing broth with chunks of meat and vegetables. Things like barley, noodles, rice, little alphabet pasta, etc are an added bonus – I really, really like the almost-chewy, wholesome quality of barley though. Get a bone-in chicken leg quarter, or 3 or 4 drumsticks, or any combination of bone-in chicken pieces. Put in a big pot and cover with plenty of water. Add some things like: an onion, sliced in half, a carrot, maybe some celery tops, herbs from the garden, peppercorns, bay leaves, that sort of thing. Bring to the boil, skim off the scum that rises, cover and let simmer on a low heat until the chicken’s cooked and comes off the bone easily – about an hour. Take the chicken out of the pot, pull the meat from the bones, return the bones to the pot and let simmer as long as you can manage – an hour more, perhaps, or longer if you’ve got time to kill, like if you’ve taken the day off work. Meanwhile, chop up the chicken (or pull apart with your fingers, depending on how you like it) and set aside. Roughly chop a carrot or two, an onion, celery if you’ve got it, plenty of garlic. In a heavy-bottomed pot, heat up some butter or olive oil (or both) over a medium heat and saute the carrot, onion and celery until they start to soften a bit. 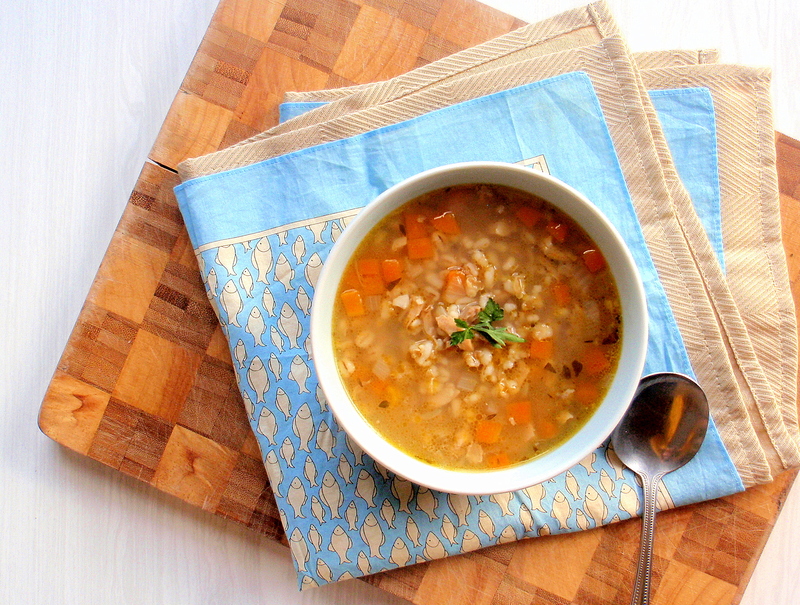 Add the garlic and some sprigs of thyme* and let cook a little bit more until fragrant, then add some pearl barley (I used about 3/4 cup, but you could use less or more depending on how thick you want it – just adjust the liquid if need be). Season with a bit of salt and pepper. 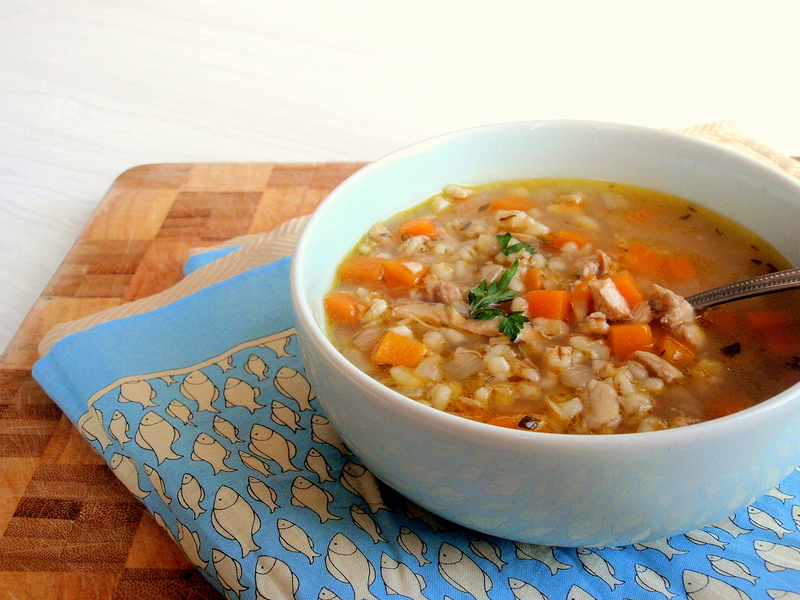 Using a sieve, strain the chicken stock from the other pot into the pot with the vegetables and barley. If it needs more liquid, add a bit of water and adjust the seasoning. 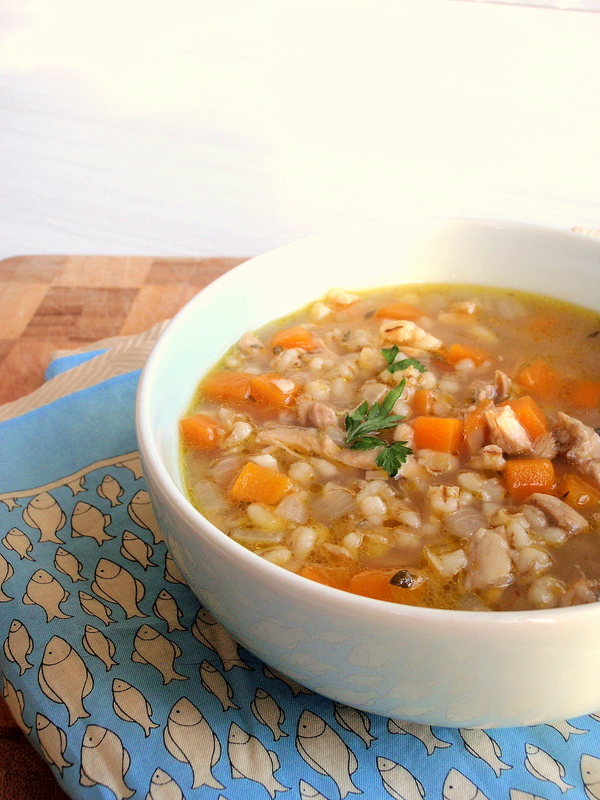 Bring to the boil and then let simmer for 30 minutes or until the barley’s nice and tender. Add the chopped chicken, heat through, taste and adjust seasoning as needed. Serve on its own or with hot buttered toast. *or whatever herbs you’ve got on hand that you think might go nicely: oregano, chopped up rosemary, tarragon, etc. Really, really quick post for today, because I’m in the middle of cooking dinner (well, I’m not physically in the kitchen right now – I’m waiting on some beef cheeks I’m braising, so I’ve got this window of time) and I really want to share this recipe for the smoothies I’ve been drinking all Easter weekend long, and I’m pretty sure if I don’t write this now it’ll never happen, because I’ll stuff myself full of tacos and do the dishes and put the sheets on the bed and then it’ll be time to collapse into the deepest sleep I can manage before throwing myself into the (thankfully short) week ahead. So. The Easter holiday has gone by in a flash and I don’t even think I’ve eaten a single chocolate egg all weekend, though I have had more than my share of hot cross buns. I came into the weekend with a hangover and a list of about eighty-five things to do and this idea that since the weekend was twice as long I was going to get ten times as much done. It doesn’t take much imagination to guess that I was wrong. But what I did do this weekend was far better than what I’d planned: I sat in the sun with a beer and a book, went for a walk in the woods, ate too much cake at an afternoon tea-party which culminated in the type of Easter egg hunt where you do half-assed looking because you’ve already eaten far too much to even think about putting chocolate in your mouth, watched David Attenborough narrate the South African sardine run and then, appropriately, cooked some salt-crusted whole sardines the next day. Fixed my car. Went for a drive around the south coast. Visited the ever-generous Sue‘s garden and had a bit of garden-envy at… EVERYTHING. Went home with my arms full of beautiful produce. And, for once, I didn’t even care that it was Easter and everything was closed* because I’m not eating out this month** and so there was no chance I’d be visiting any of my favourite cafes anyway. 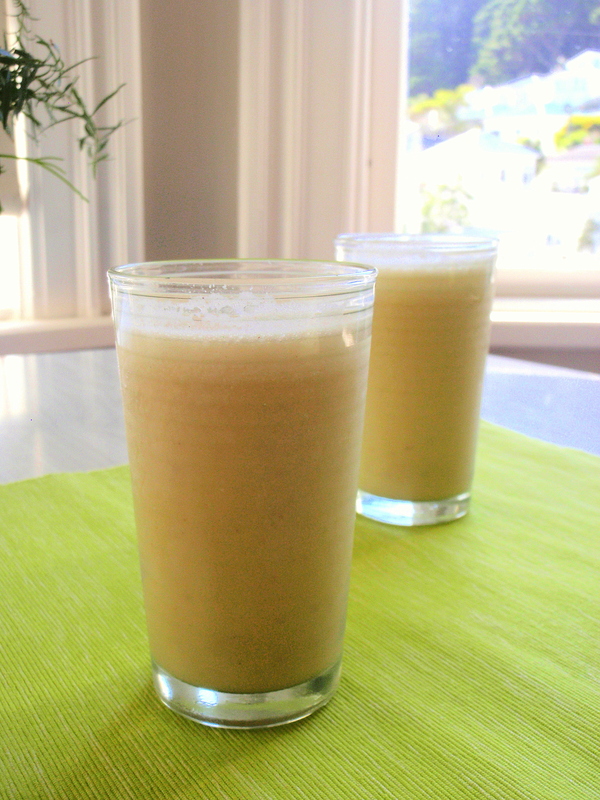 So instead of brunch at a cafe (and to fortify myself before leaving the house, just in case a growling stomach led me astray) I made myself one of these smoothies one morning. It was so good, I had it the next day. And the next. And I probably won’t forget about this one anytime soon. 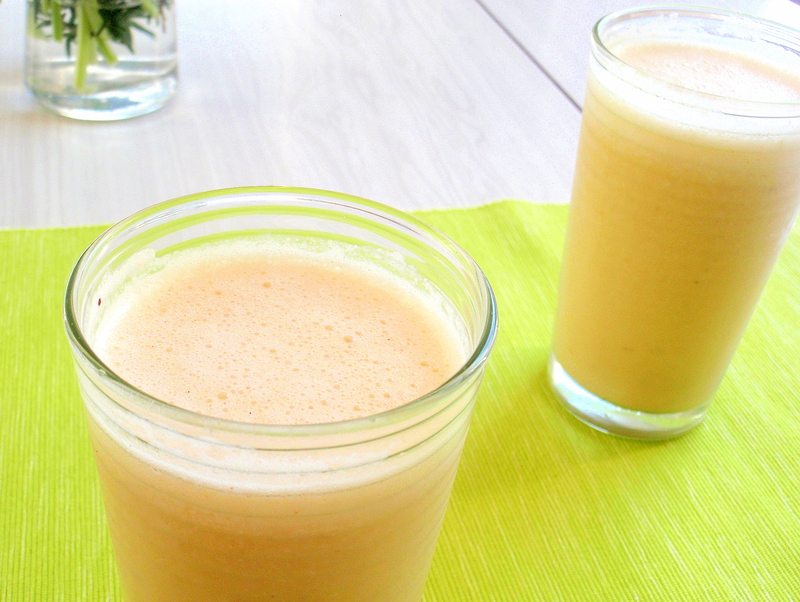 Banana is such an obvious smoothie flavour that it’s almost silly posting a recipe. And I wouldn’t normally think to make a smoothie from a recipe. But hear me out: this particular combination of ingredients is good. It’s like a banana-tinged eggnog, or a creamy, slightly tangy version of a banana ice cream mixture. 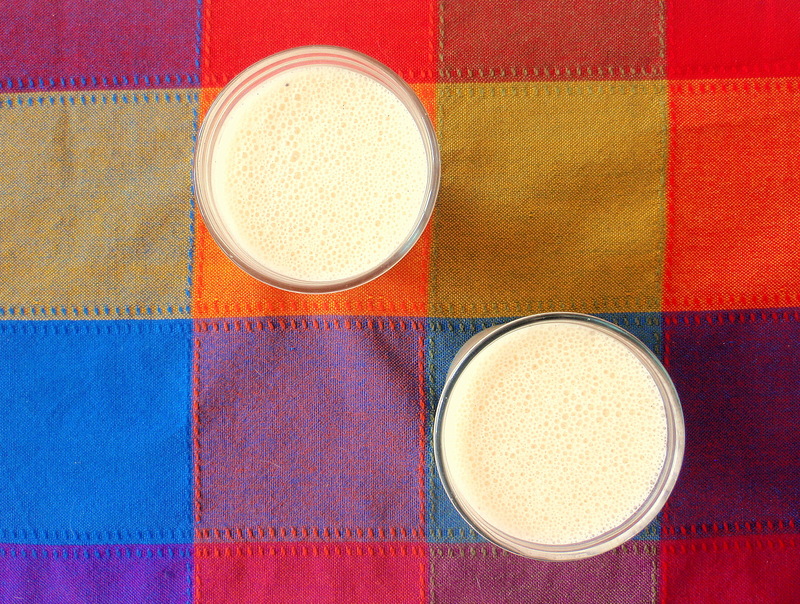 And despite how good it tastes, it’s actually pretty good for you – just banana, yoghurt/buttermilk, egg yolks (protein! ), as much maple syrup as you like. And, the most important part? It worked. I was full for ages, didn’t get any weird cravings, managed to stay awake despite not having had coffee. I didn’t even miss my cafe brunches. (Er, okay, maybe just a little bit.) 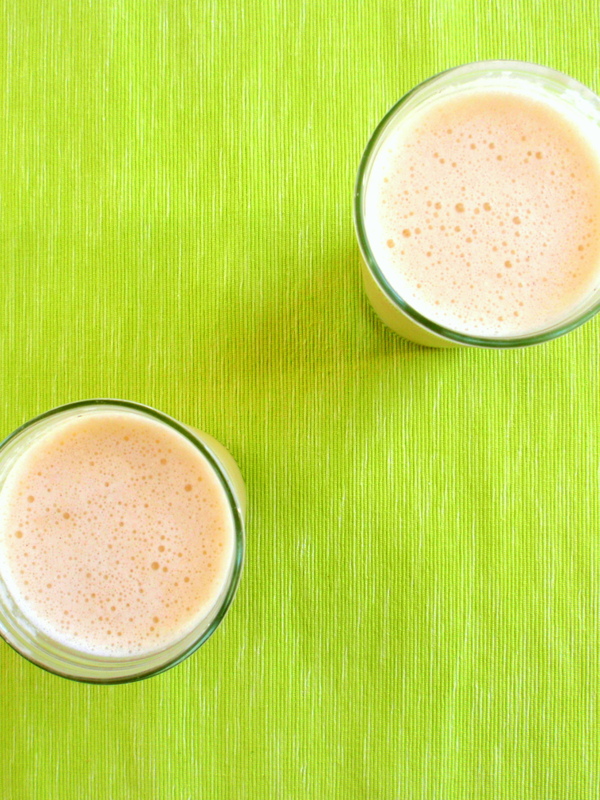 But on a sunny weekend morning it was pretty hard to beat a nice, cold, sweet smoothie. This is a recipe I’m holding onto. *though I did do some Easter-closure-induced panic buying at Moore Wilson’s that was probably wholly unnecessary. **For whatever reason I’ve set myself this challenge of not eating out this month (you can read all about it here!) and so far it’s been a bit of a challenge, but mostly okay. 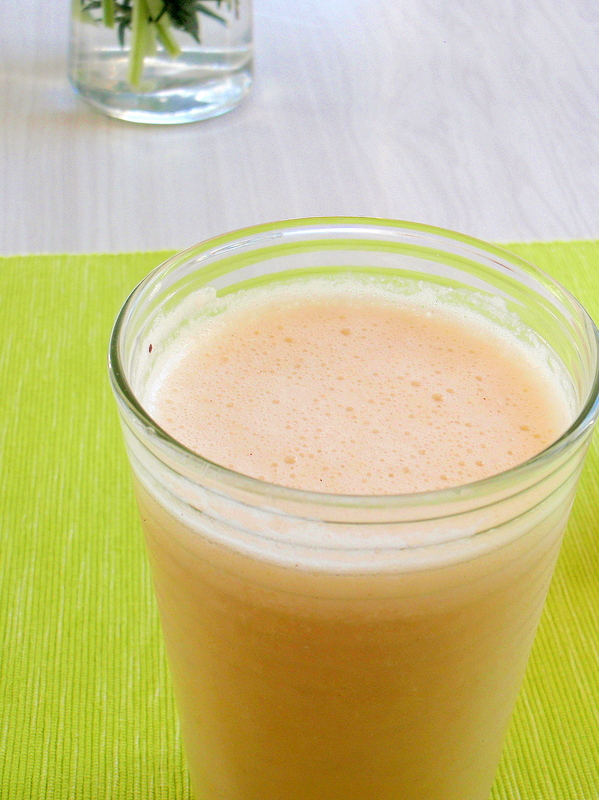 Chuck everything in a blender*** and blend until smooth. Taste, adjust spices/sweetness to taste, pour and serve. Makes enough for two tallish glasses. *It’s by Sally Fallon Morell, who recently gave a series of talks in New Zealand – rather interesting stuff about the benefits of raw milk and butter and that sort of thing. **Fresh is good. Now if you’re a bit squeamish about the egg yolk you can leave it out, but if you’re at all the type of person who eats raw cake batter or sneaks spoonfuls of custard before you’ve cooked it or if you like eggnog or, heck, I dunno, if you like your smoothies a little bit richer and, well, smoother, and if you want that little extra protein to keep you going for longer, just do it. Trust me. I was uncertain about it at first, but it really is delicious, and as long as your eggs are from a good source and they’re reasonably fresh you’ll be fine. ***I find it helps if you have the ice towards the bottom of the blender (put it in first! ).